If you already have users that you’d like to use in Projectopia as Team Members then you wont be able to add them again as WordPress does not allow duplicate email addresses. Instead, we’ve built a tool that converts existing WP Users to Team Members. The conversion method is different depending on if the existing WP User is a WP Admin or another role (eg. Subscriber, Editor etc). We’ll run through both methods here. If you would like to link existing WP Admins as Team Members so that they can be added to projects, then they need a Team Member created and linked to their existing user. To do this, simply log in as the WP Admin that you want to link and go to the Projectopia Admin dashboard. You’ll see this box on the dashboard. 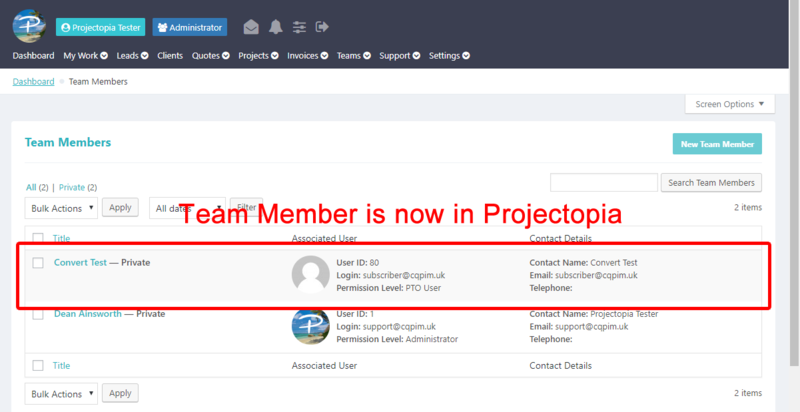 All you need to do is click “Create Linked Team Member” and a Team Member object will be created and added to Projectopia. For all other roles in WordPress, for example Editor or Contributor, the user needs to be converted. This process will create a Team Member in Projectopia and will change the user role of the existing user. To convert a user, head to the WP Users page and hover over the user that you want to convert to a Team Member. You’ll see a link that says “Convert to CQPIM Team Member”. Click this, and the user will be converted to a team member.